The 2016 winner of the Keir Choreographic Award is Ghenoa Gela, a Rockhampton-born, Torres Strait Islander dancer and choreographer who was raised in mainland Australia. 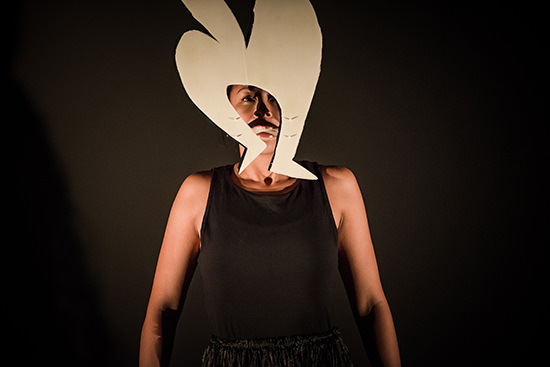 The final night audience at Carriageworks not only greeted Gela’s jury win ($30,000) rapturously but also awarded her the audience choice award ($10,000). These prizes will provide independence and a tremendous creative boost for a talented young choreographer whose Winds of Woerr at the 2014 Adelaide Fringe (and subsequently Next Wave) first excited my interest. Trained in contemporary Western dance, Sydney-based Gela has a passionate commitment to sustaining Torres Strait culture and is clearly engaged in a quest to bring together not merely forms but peoples—evident in her casting non-Torres Strait Islander dancers to perform her Fragments of Malungoka—Women of the Sea. 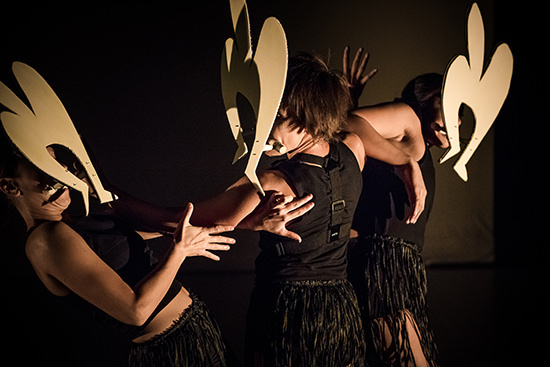 The final passage of the work entered fully, even winningly, into the powerful dance of Gela’s heritage while the preceding episodes seemed tentative, perhaps reflecting the uneasy engagement between dance forms and cultures but also evidence of the awkwardness of a kind of dance theatre in which abstracted tensions play out between the three dancers. These were complicated by the curious addition of video surveillance feed from one of the performers, suggesting perhaps a self-conscious monitoring, but one not clearly integrated, more a mysterious backdrop detracting from the tight weave of the trio. The 2016 Keir Choreographic Award program has aroused more debate than the first in 2014. Andrew details some of the issues raised in his report. Debate is healthy, indeed invaluable, given that the KCA is the only award of its kind for Australian contemporary dance, let alone one focused on emerging choreographers and at a time when dance is going through many changes. The addition of a public program of talks and other events this year enhanced audience understanding of some of the discussion in contemporary dance circles; the KCA-Critical Path forum with four South-East Asian curators was especially informative (more about this in a future e-dition). But there are challenges to be met by the KCA organisers. Of the four finalists seen at Carriageworks, Sarah Aiken in her Tools for Personal Expansion seemed to not a few in the Sydney audience to have created the most formally and satisfyingly complete work with its low key rhythms and subtly, and drolly, unfolding magic. But we in Sydney didn’t get to see the creations of Paea Leach and James Batchelor whose work Andrew Furhrmann thought “arguably the most formally satisfying of the [eight] semi-finalists.” The two-city creation of the Keir Choreographic Award is admirable and is developing (with the addition of Critical Path to the fold), but it’s frustrating for Sydney-siders not to be able see the whole competition and for those in Melbourne not to enjoy a final re-estimation, let alone the thrill of witnessing the win and having a hand in deciding the audience prize winner. In an ideal world, the eight works would be performed in both cities. The cost may be prohibitive, but we have to admit a somewhat schizoid feel to the final in Sydney, where we have only half the evidence with which to judge for ourselves. Perhaps as the Award grows in strength and influence it might be able to play out equally in Sydney and Melbourne and then beyond—live streaming even! A not uncommon opinion was that the eight works were largely under-developed and, in some cases, over-propped and technologised. The Melbourne Fringe and Next Wave have long, and successfully, supported selected emerging artists with dramaturgical and other assistance. Again cost might be an issue, but the advice of independent KCA-appointed dramaturgs or experienced choreographers across the duration of creation might develop the emerging artists and present audiences with more cogent works. By its very nature, the Award is nurturing, but to what degree? We’ll certainly be talking about it in coming e-ditions as we grapple with “the choreographic.” What is it? Is it an appropriation or co-option of dance by galleries and art biennales? A new niche for dance? Concept or con? And how does it relate to the conceptual choreography seemingly central to the Keir Choreographic Award, this year’s idiosyncratic winner aside. I happily add that I enjoyed Martin Hansen’s It’s All In My Veins, an intelligent and witty take on the importance and limits of realising a performable dance archive in which three performers mimicked classic caught-on-film moves by Isadora Duncan and Nijnsky through to de Keersmaeker and Beyonce’s blatant appropriation of her choreography. I rolled with Rebecca Jensen’s propulsive, physically bold exploitation of the large Carriagework’s space in Explorer, even though the cumulative meaning of its imagery of immersion and flight proved elusive. I’ll not forget the final moment of Sarah Aiken’s Tools for Personal Expansion when one of her fellow dancers offers with a spooky smile the ‘hand’ of Aiken’s fantastically elongated arm to a front-row member of the audience. The Keir Choreographic Award has again provided welcome indicators as to where dance is now and might likely go, this time keeping us on our toes with its choice of a winner and engaging, via its public program, an audience eager for context, critique and debate. You can see parts of works by finalists in this video. The Keir Choreographic Award Jury: Bojana Cvejic (Belgrade), performance theorist and performance maker based in Brussels; Pierre Bal-Blanc, Documenta 14 curator and independent art critic based in Athens and Paris; US based choreographer Sarah Michelson; inaugural recipient of the KCA in 2014, Atlanta Eke and Phillip Keir, Keir Foundation founder.